One of the things you are most likely to want to do as you start running or cycling is know how far you’ve travelled on any exercise session. If you run on a treadmill or cycle on a training machine, then the kit will work that out for you. But out in the fresh air you need some sort of help. If you don’t have a pedometer or more accurate GPS you could sit down with a map and work distances out manually. But there is another way. 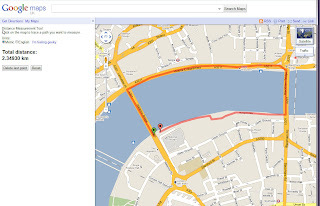 Google Maps has a distance measurement tool, and it is really easy to use. We’ll show you how. 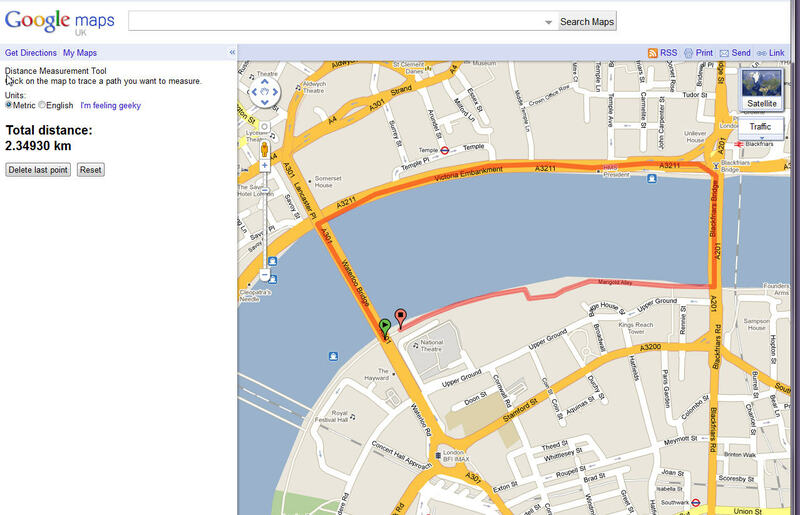 First off, go to Google Maps and find the location of the start of your run, cycle or other activity. Now look down at the bottom left corner of the map. You’ll see a scale bar there telling you how distance on the map relates to distance on the ground. Play with the zoom feature and watch this change. To the immediate left of this legend you may see a tiny icon that looks like a ruler. If it is not there, look in the top right of the screen and click ‘New!’, then choose to enable the Distance Measurement Tool. Incidentally you’ll see a whole load of other Google Maps features you can play with under this New heading – but don’t get distracted for now! Click Save Changes and you should now see the little icon to the left of the scale bar. Click it and the information column to the left of the map will change. Here you can set distance measurements to metric or what the Americans call English but what we in the UK call Imperial. Click ‘I’m Feeling Geeky’ and you can select a whole range of other measurement systems which are totally useless for human fitness training but which might be fun to toy with. Furlongs, fathoms, nautical miles and lots of measurements I’ve never even heard of are here. When you’ve chosen a distance measurement, simply click on the map to indicate your start point, then follow a route, clicking every time you change direction so that the line which appears on the map traces your real route precisely. Watch the distance ratchet up on the left of the screen. The great beauty of this system is that it is really easy to use, totally free, and available anywhere you’ve got access to a computer and an internet connection. It isn’t going to be totally accurate, but having tested it on routes I use with a GPS I’d say it is accurate enough for many of us. And it can be used to pre-plan activities in unfamiliar places which ought to help you avoid doing too much or too little in any session. Of course it can’t take account of gradients so if you do use it as a planning tool you might be advised to take a look at an Ordnance Survey map too – just to see what the contours look like.